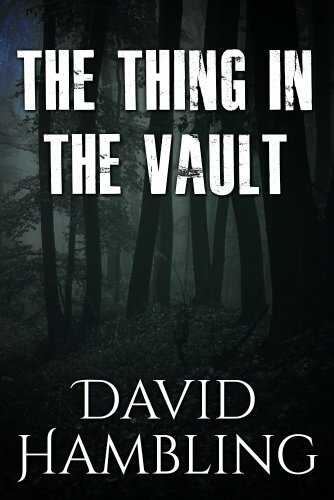 In my attempt to review everything published by author David Hambling, I decided to take a quick break from his phenomenal Harry Stubbs Adventures Series to examine some of the stand-alone titles that he’s written, starting with The Thing in the Vault. My entirely positive experiences with Mr Hambling’s fiction have already resulted in him being placed at the very top of the ‘favourite authors’ list I hold in my head, and as such I’ll automatically pick up a copy of something if it bears his name, as long as I can afford to do so. Even if I hadn’t come across Mr Hambling prior to this, however, the full title of the subject of this review would have readily enticed me anyway: The Thing in the Vault: A hard-boiled tale of the Cthulhu Mythos. I have a severe weakness for any kind of fiction that can be described as ‘hard-boiled’, regardless of whether it involves the Cthulhu Mythos specifically, occultism in general, or is entirely free of occult or supernatural, and as such The Thing in the Vault readily sprang to the top of my ‘To Be Read’ list when I was plotting out my reviews for the next few months. The title is certainly tempting, being just vague enough to create an atmosphere of mystery and intrigue, while containing hints that it contains occult overtones; specifically, whatever the titular ‘thing’ is that is being stored in some kind of vault. And it’s allied with an excellent piece of cover art that illustrates that an author doesn’t need to invest a huge amount of time and money to create something that will draw in the prospective reader as they’re scrolling through the seemingly never-ending list of fiction available on the Kindle platform. The imagery of the cover shows a dimly-lit forest wreathed in darkness, positively oozing with menace and danger, which is entirely thematic to the narrative of the story, and is supported by some well-chosen font; the lettering of the title itself is slightly cracked and damaged, while the author’s name has some slightly curved lettering at the edges of the ‘D’ and ‘H’ which immediately stands out. Both image and font have been blended together expertly, with the white font standing out clearly against the dark background imagery, and it all comes together to suggest a quality piece of work, both for the cover itself and the writing inside. While you should never judge a book by its cover, it is true, my experience has been that a good-quality cover (which does not have to be necessarily expensive for the author or publisher) will more often than not indicate a higher quality of story to be found within. Moving onto the story itself, at first glance it appears to be stacked up with the usual, tired tropes of the hard-boiled fiction genre: Wade, a private investigator running a one-mand band agency, is contacted by a mysterious client to track down someone that the client wants found, only to run into trouble when he makes it to the backwater town that the targeted person is supposed to reside in. So far, so generic storyline, but almost from the beginning the author’s skill in writing and imagination starts to come to the fore: although the client is obviously keeping information back, de reigueur for the genre, they actually know where their missing person is, or at least quite a specific area, and have also been in contact with them. Instead, Wade is tasked with visiting the mysterious ‘Professor K’ and checking that the formula he’s developing is actually worth the investment; and to send the details back as soon as possible. And when Wade does visit the isolated little village that the Professor is working in, Hambling once again disrupts the usual tropes: although there are rivals who have also made their way to his location to check in on the Professor’s formula, gangster-types wielding pistols and Chicago typewriters, there’s absolutely no violence, and even a minimum of confrontation. Instead of the expected fight-fighting and gunplay that might have appeared in a potboiler by another author, here Hambling takes the chance to build in some excellent characterisation and dialogue, establishing the different groups interested in the Professor’s formula and fleshing out characters that might otherwise have been little more than two-dimensional redshirts scripted to die violent and entirely unremarkable deaths. And instead of a lengthy search for the Professor, he instead finds Wade and the other investigators and is more than happy for them to see his formula and what it has created, once again playing against the usual genre standards. Hambling has an eye for atmosphere and descriptive text in particular; his portrayal of the town of Newfane is deft, invoking the idea of a backwater town, hostile to strangers, and that has a mystery lurking just out of sight, and yet managing to do this effectively in the constraints of a wordcount that hovers around novella-length. That atmosphere continues to build, slowly and subtly, as the Professor shows off his formula to the assembled investigators, demonstrating that it, in fact, creates an extremely smooth and impressive kind of moonshine from the worst kind of rot gut alcohol. It hasn’t quite finished, however, and so Wade volunteers to stay in the laboratory overnight to ensure that there aren’t any tricks being played. By the time the laboratory comes into play, it’s obvious that something isn’t right, as the author ratchets up the tension: although the Professor seems to be on the level, as is his formula, there are unsettling questions: how, exactly, has he learnt to create this miraculous formula? Why is he based in a laboratory that is actually a series of holes and caves carved into the underground rather than a building, and how was it all built and transported? And, most of all, who are the mysterious benefactors assisting the Professor, and why do they speak strangely, walk oddly, and constantly wear cloaks to hide their figures? All of the questions are answered in the last few chapters, as the tension erupts into outright, albeit brief, conflict, and Wade and the Professor are forced to flee in an incredibly tense chase sequence that becomes outright horrific when the nature of the benefactors are revealed, and the level of control that they have over Newfane and its occupants. The Thing in the Vault is a fantastic piece of hard-boiled detective fiction, perfectly blended with Lovecraftian creatures and threaded through with cosmic horror, and definitely left me wanting more, both from Mr Hambling and the character of Wade himself. I also appreciated the little hints and Easter eggs that indicated that The Thing in the Vault is actually part of the wider shared universe that exists in his Shadows of Norwood continuity, particularly the identity of the mysterious agency that makes contact with Wade near the start of the novella: it’s this sort of detail that makes even smaller works like this even more enjoyable for the reader. The Thing in the Vault is a thoroughly entertaining work, which also works as an excellent introduction to Mr Hambling’s works, and deserves to be picked up by any self-respecting reader of the Cthulhu Mythos genre. Thanks! Raymond Chandler lived in Dulwich — and went to school there — which was all the excuse I needed to write this as part of the “Shadows from Norwood” Mythos cycle. (I also borrowed/referenced some of The Great Gatsby as I felt another take was needed on a certain character).